Every summer when the crape myrtle blooms, I remember the cold rainy November day I planted it, one month after we bought our house. Although we sat on our collegiate director’s chairs and dined on beans and rice, I had to have my inaugural tree. I counted up every extra dollar and raced to the nursery in the rain to buy a mere twig. I didn’t have to fight for it, since I was the only customer. These days, I’ve always got customers, like the bees! I didn’t even know what it was when we were house-hunting. I’d fallen in love with its frothy pink flowers at the “dream house” we imagined as ours. That old bungalow was falling apart, but its leaky French doors framed the most beautiful tree I’d ever seen! Over the phone, my mom knew it instantly with my rapturous description. Our romance with one plant propels us to dig another hole. After all, it needs companions. Then, with our heady success, we find out about all kinds of plants and keep on going until we flat run out of room. To convince us to plant another hole, plants entice us with romance, including childhood and first-garden memories. But they also entice us with other psychoactive properties. To explain a few of their tricks, this week on CTG, author Susan Wittig Albert joins Tom with true tales about how plants benefit our health and calm, energize, or make us high. As always, in her latest China Bayles mystery, Mourning Gloria, Susan activates our senses with a stay-up-all-night plot, along with facts, lore, and the mystery of plants, including morning glory. If you’re drinking coffee right now, Susan explains how recent research indicates its value as stroke and prostate cancer protection. And if coffee prices get too high for you, collect the leaves from your yaupon holly, the only North American plant that contains caffeine. Need some more energy? Go for rosemary. Susan cites studies at the University of Chicago where students undergoing testing were more alert and did better with rosemary. I plan to try a tip from China Bayles’ cohert in crime, Ruby: dab a bit of rosemary essential oil in your car (or in your office!). Sometimes I cut a sprig of rosemary for the car. That works too, if you remember to take it out before it crumbles. Or, dab some lavender to calm you down. If you can’t grow it, Susan suggests a touch of lavender essential oil on light bulbs. Or a sachet under the pillow. I’ve never tried catnip tea to calm me down, but I may do it yet if it doesn’t rain soon. If the drought doesn’t get it, I’ve always got catnip in the cat cove. I can’t positively say this is ‘Walker’s Low’ but from my notes, I think this is it. It has performed better for me than any other, with silvery leaves for me, euphorbia for the cats, and flowers for beneficial insects. There are countless plants that make people high, or can kill them, as you well know. Since 1992, when Susan published the first China Bayles mystery, Thyme of Death, she’s given us the inside story behind plants and their valuable contributions, along with their dark sides. Hit Susan’s website for plant facts, historical uses, and recipes. Follow her journeys as a writer, gardener, and personal life insight on her blog, Lifescapes. And be sure to check out her life-journey inspiring non-fictional writing, too. I’m psyched about my new shrimp plant. The tag just said shrimp plant, but looks like it’s a yellow or apricot. I already have several and have divided them, but I couldn’t resist another one. Shrimp plant (Justicia brandegeana), is Daphne’s Plant of the Week, since this is such a perfect energizer for those shady spots we all have. It’s very drought tolerant, and its showy bracts attract us, while the tiny flowers attract hummingbirds and butterflies. And, they are easy to divide from the roots. You may even get another plant when a branch flops over and roots. I also couldn’t resist this showy yellow. From past experience, this one isn’t as cold hardy as the others, but I had to give it another spin. 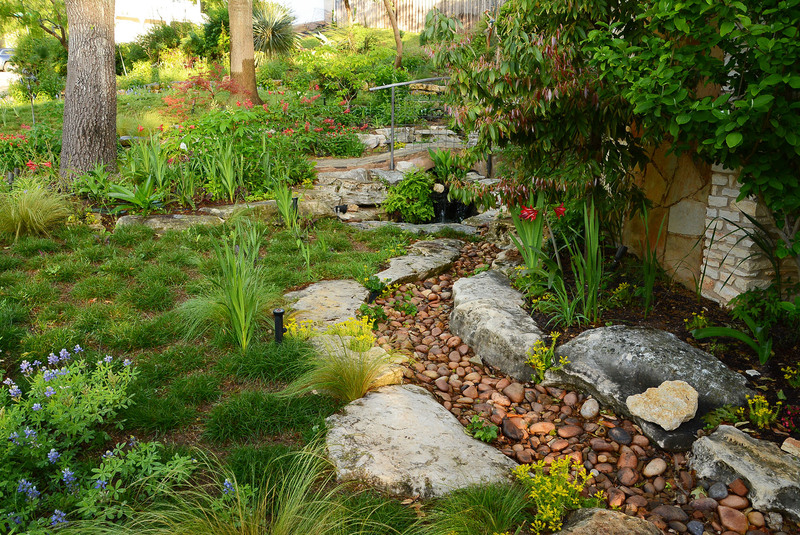 On tour, visit Debi and Mark Akin’s pond and garden, a testament to how plants and working with them soothe our souls. Since its first broadcast, I’ve heard from people who watch it when they just want. . .to. . .calm. . .down. And Mark’s story about Debi’s kidney that saved his life reminded me that my own worries are very minimal. Daphne’s Question of the Week comes from a viewer: Is it safe to use Mosquito Dunks or Bits in rain barrels that water the vegetable garden? Yes, perfectly safe. Mosquito Dunks or Bits contain the larvicide Bacillus thuringiensis israelensis (Bti). Microbial larvicides are bacteria that only target certain insects. They don’t harm pets, people, or the wildlife we want. In this case, the toxin disrupts the mosquito’s gut. So, even bacteria figure into our holistic gardening picture. You can also use a window screen over your open rain barrels/buckets. If the mosquitoes can’t land on the water, they can’t breed.